Designing a kitchen in any home can be a challenge, but planning a farmhouse kitchen for a period home needs careful thought to ensure the tone, style and colours are just right. The relaxed country style of farmhouse kitchens translates well to homes of many styles and locations: use these farmhouse kitchen design ideas as inspiration for creating your farmhouse kitchen successfully. Find out how to design a kitchen from scratch in our essential guide. Even if you don't live in a gorgeous country farmhouse, you can capture elements of the style. This is a look that's all about being warm and inviting, yet simple and unpretentious – think exposed natural wood, classic Shaker-style cabinetry and a soft colour palette. When designing your kitchen, create a more relaxed feel by including freestanding furniture that you can move around if needed. A kitchen table, kitchen island or butcher's block at the heart will make it a space where everyone can gather. Personalise the design by displaying characterful china and glassware on an open dresser. To complement the furniture, invest in that farmhouse staple, the traditional range cooker, as well as a Belfast or butler's sink. Accessorise the space with unrefined linens and vintage kitchenalia. As for the kitchen cabinetry, think bare wood or painted cabinetry. The upside to both these finishes? You can easily repaint kitchen cabinetry when it becomes knocked – or if you fancy a new look – while wood finishes can easily be rubbed back and reoiled when they need it. The kitchen in this Grade I-listed Tudor home in Somerset has been fitted with bespoke handmade cabinetry from Midelwood, painted in a mix of Mylands’ Mid Wedgwood, Hawkesmoor and Broken White, and topped with Bianco Latino granite from Bristol Marble & Granite Company. Concrete moulded faux flagstones, from Traditional Flagstones, were a fraction of the price of real stone. An electric pewter Aga is complemented with delicate butterfly tiles from Wellington Tiles. The pendant lights above the island are from La Fleure in Langport. The sloping roof above the dining area was part of the original kitchen, but the glass was replaced during this latest renovation. An arched doorway in the stonework leads to an old falconry, now used as a boiler and boot room. The table was handmade by Ian Weston of Shropshire, and teamed with bespoke Windsor chairs from Robin Clarke. 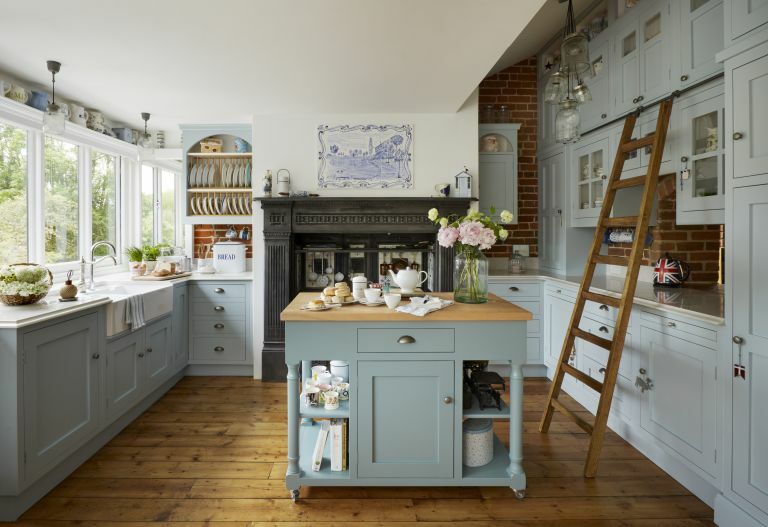 Old and new, fixed and freestanding units combine for a nostalgic effect in this farmhouse-style kitchen in a charming Victorian home in East Sussex. The owners had solid wood cabinets made when they first moved in, and recently added marble worktops. Crockery fills every shelf of the kitchen, while its focal point, the Aga, gives off enough warmth for teatowels to dry quickly on the laundry airer. For a similar crinkle pendant light, try Willow & Stone. Creating a classic Shaker-style kitchen is perfect for an unpretentious farmhouse look. The country-style kitchen in this Victorian home in rural Kent features cabinets in Farrow & Ball’s Shaded White, oak worktops and a freestanding unit from local antiques shop Mark Maynard. Originally the kitchen was in a smaller room, so the owners swapped it with a larger breakfast room to create a family-friendly kitchen-diner. The blinds are made up in Cath Kidston fabric. Dating back to the 1700s, with a Victorian era extension, this stone farmhouse is brimming with rustic character. The kitchen is fitted with mostly freestanding furniture including a catering-standard gas cooker. The sink unit and shelves were made by local salvage yard Shiver Me Timbers, and the engineered wood floor is by Absolute Flooring. The kitchen in this 16th-century oak-frame home in Shropshire has evolved gradually from odd pieces of furniture collected over the years. An old dresser has been turned into an island thanks to the addition of a granite worksurface, a Carron sink and tap, and a coat of Mole’s Breath from Farrow & Ball. The engineered oak flooring is from Quick-Step and the pendant light and stool are from The Interior Co. Inspired by French country style, the kitchen in this Georgian farmhouse in Cambridgeshire has been a stylish update on a tight budget. The old solid wood units were refreshed with Farrow & Ball’s Light Gray paint and chunky door knobs. Marble wall tiles from Fired Earth finish off the light, chalky palette. The cooker is from Stoves. Find out how to paint kitchen cabinetry to update your farmhouse kitchen. Built in around 1600, this Sussex barn conversion is full of charming timber beams and has a stunning flagstone floor. The kitchen was designed by K100, painted in cream and complemented with duck-egg blue tiles to offset the dark wood. The central island was designed to fit in around a supporting vertical beam. A large Lacanche range cooker takes pride of place along the far wall. The kitchen in this 400-year-old farmhouse enjoys fantastic views across the Cotswold hills. Bespoke cabinetry by Belgian company Eiken Project was shipped to the UK before being installed and fitted with the latest integrated appliances and an electric Aga. The floor is reclaimed terracotta, laid in a Flemish style. Combining painted cabinetry with natural wood finishes, the kitchen in this 200-year-old North Yorkshire farmhouse has a warm, eclectic feel. Richard Pooley made the units, which are topped with Shivakashi granite in a leather finish from Aktiv. The light fittings are from Jim Lawrence, the sink and tap are from Taps-online.com, and for similar multi-coloured slate floor tiles, try Floors of Stone. You don’t have to live in the country to get a farmhouse look, as this Victorian villa in Tunbridge Wells proves. A vintage pine farmhouse table and mismatched wooden school chairs create a relaxed, characterful space, lit by original 1950s Benjamin RLM Crysteel enamel pendant lights. The owner inherited the Aga and updated the tiled surround, and uses a second table with blue drawers as a prep and storage area. Find out more about creating Victorian- and Georgian-style kitchens in our guide. Farmhouse kitchens carry colour well, so liven up your space with this Groove Panelled Shaker kitchen, seen here in Red, from Parlour Farm. The simple in-frame units have been paired with tongue-and-groove panelling for a characterful detail, while a mix of worktop materials adds warmth. Complete kitchens from £28,000. Find more inspiration for a colourful kitchen in our feature. Synonymous with craftsmanship and quality, solid wood is a fitting material for a farmhouse kitchen. Handcrafted by Martin Heydon Joinery, this solid ash kitchen features simple flat-faced cabinetry rather than a traditional in-frame design – a contemporary twist that makes the natural grain the real hero. From £15,000 for cabinetry only. The owner, a skilled carpenter, made the bench using materials reclaimed from elsewhere in the house. The table is from Bramblecrest, and the three pendant lights are from Solid ID. Farmhouse kitchens have a relaxed look that's perfect not just for a painted finish but also for alternatives to classic base cabinet doors. Here, a pretty fabric has been used beneath the worktop to create a cute, vintage look. Use it in your kitchen to hide modern appliances, such as the washing machine. Fabrics by Vanessa Arbuthnott. Farmhouse kitchens are most successful when the colour of the cabinetry or accent shades are natural. That means plenty of woody tones, but also pale blues, pale greens and pale yellows. The benefit of these colours? The wood tones create a warm feeling, while the pastels will make the room feel brighter and lighter, too. Want more advice on decorating a period property?